Fortnite: Battle Royale’s Slurp Juice is not a real drink. At least, it wasn’t. 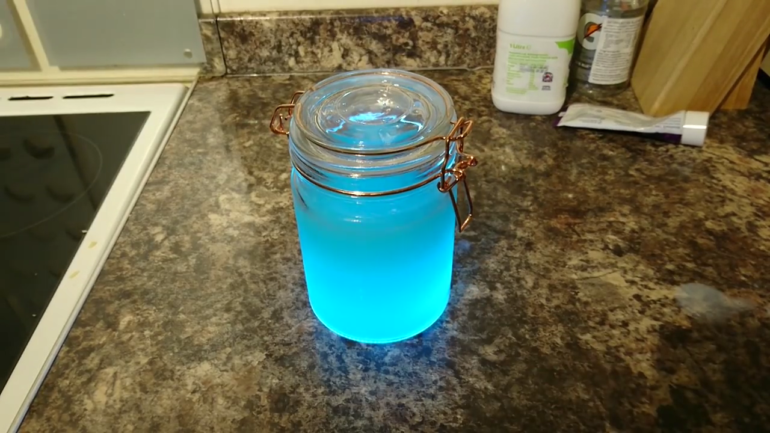 One brave YouTuber has merged real-life edible (and not-so-edible) products together to create a glowing concoction similar to the consumable found in Fortnite. Last December, YouTuber Craig Howe mixed Gatorade, milk, and toothpaste together in a mason jar to create a Slurp Juice recipe inspired by the Fortnite drink’s in-game look. Throwing two LED lights underneath the jar makes the drink look exactly like its in-game counterpart, complete with the Slurp Juice’s iconic glow. In a YouTube video demonstrating the concept, Howe shows off the steps necessary to create the recipe and even drinks the concoction for his fans. The Fortnite subreddit has known about Howe’s invention long before Howe shared his tell-all on creating it. Before his video went live, Howe posted a picture of the drink onto r/FortNiteBR, sparking endless interest in how he created it and what it tastes like. Even Epic Games gave Howe its approval. “Can’t wait to replenish my shields,” one Epic Games representative named arctyczyn wrote. Since Howe’s creation, several other copies have cropped up, including an alcoholic version from RNJ Cocktails that’s much easier on the tastebuds than Howe’s. That channel’s Slurp Juice even has a slight glow to it, although none compare to Howe’s take, which looks practically identical to its in-game counterpart once an LED light is placed underneath.